Sumo Paint is very competitive image manipulation tool that gives you the ability to edit and create images directly in your browser window. 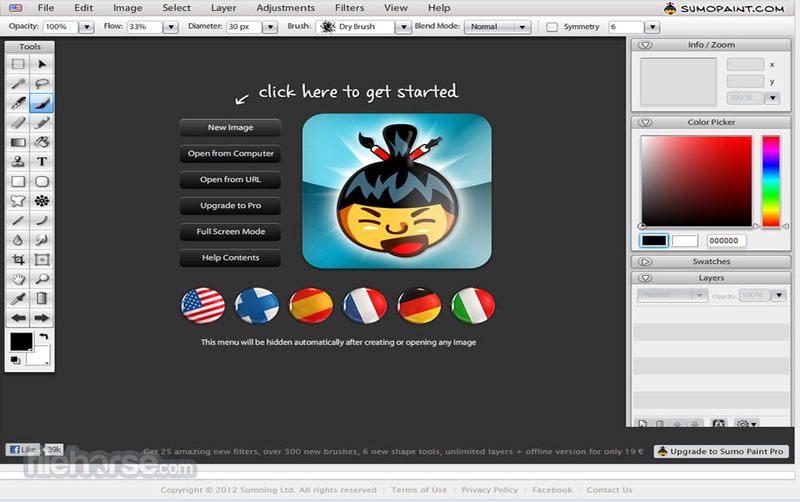 Sumo Paint is an online image editor, without need to install anything to your device. 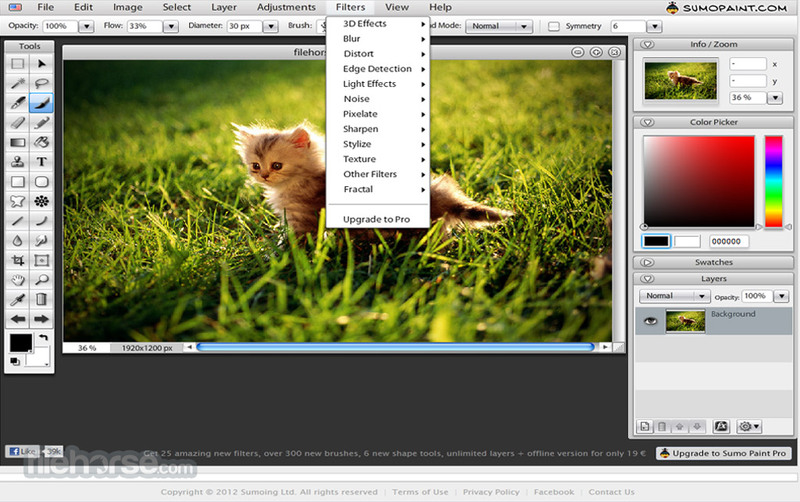 It's the most versatile photo editor and painting application that works in a browser. You can open and save images from your hard drive or save it to cloud. If you are professional user who has accustomed itself to expensive Photoshop and Gimp environment and features, then Sumo Paint will be perfect tool for you. And the best thing is, Sumo Paint is absolutely free! But don’t let its powerful features distract you, because its interface is intuitive and fast, with perfect support for novice users who are only entering into the world of image manipulation. If you are looking for an image editing app that is powerful, that enables you to not only manage few basic tools and filters but gives you access to wide array of image manipulation tools, painting, layer management, and professional UI, you have very little choices available on the market. However, by visiting Sumo Paint you can gain access to all those features and services, in freeware package that incredibly well emulates Adobe Photoshop and enables you to get professional-grade tools for free directly inside your web browser. Free online painting in Browser! Sumo Paint is a very ambitious and highly capable online image editor that enables anyone who has installed Adobe Flash plugin to easily access tools that will enable them to quickly modify their images using many professional tools, including tools for painting (brushes and many secondary tools that are helpful for painting), layers, color picker, swatches and more. To better support people who want to create brand new art directly from the tabs of their internet browser, all the brushes that are supported by Sumo Pain (Ink Tool, Brush Tool and Pencil Tool) can be precisely customized with your own parameters for opacity, diameter, brush shape, mode and mode value. Same detailed approach to customization can be found with every other tool, enabling you to take full control over the way your images are edited, created, transformed, saved and exported. By copying the look and feel of popular Adobe Photoshop, UI of the Sumo Paint definitely manages to be look professional and capable, definitely being focused on providing intermediate and professional-level users with all the tools and services they would need to completely manage all their image editing needs. While free version of this app is highly capable, Sumo Paint can also be used with 2 premium account tiers (all requiring single purchase with no monthly or yearly subscriptions). With those premium tiers users can get access to more than 35 advanced filters and tools, editor will no longer hosts ads, and users can even get the chance to download standalone desktop client editor app that is powered by Adobe Air and can work while computer is offline. Free online painting in Browser! 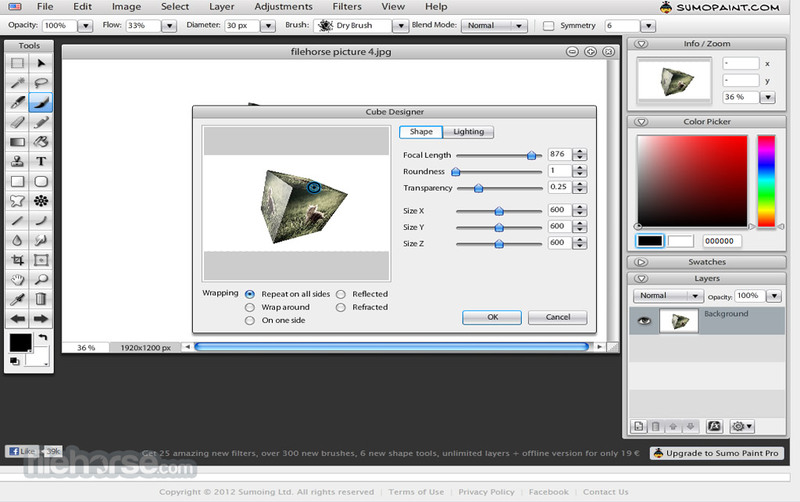 From the moment you arrive on Sumo Paint’s editor, you will notice how closely it resembles the UI of Photoshop. The basic layout of all the tools and elements remains the same, with work canvas being surrounded with Tools bar on the left, array of tools (including Layers manager) on the right, and main app settings area at the top, with countless of tools and services being placed inside File, Edit, Image, Select, Layer, Adjustments, Filters and View dropdown menus. Filters section is especially impressive, offering large selection of tools that can dramatically change the way your image or layers look. Anyone who has ever been in contact with Photoshop will have no problems managing Sumo Paint. Free version of Sumo Paint can be used for free, without the need even to create new account (all tools including saving will not prompt you for registration). Pro versions of the app ($9 single purchase) removes ads from editor and unlocks 35+ PRO filters and tools, while Pro Plus license ($19 single purchase) gives you access to desktop app powered by Adobe Air platform. Sumo Paint is one of the most powerful graphics editor for your web browser, enabling anyone access to professional-grade tools for free. Amazing and Free online painting in your Browser!